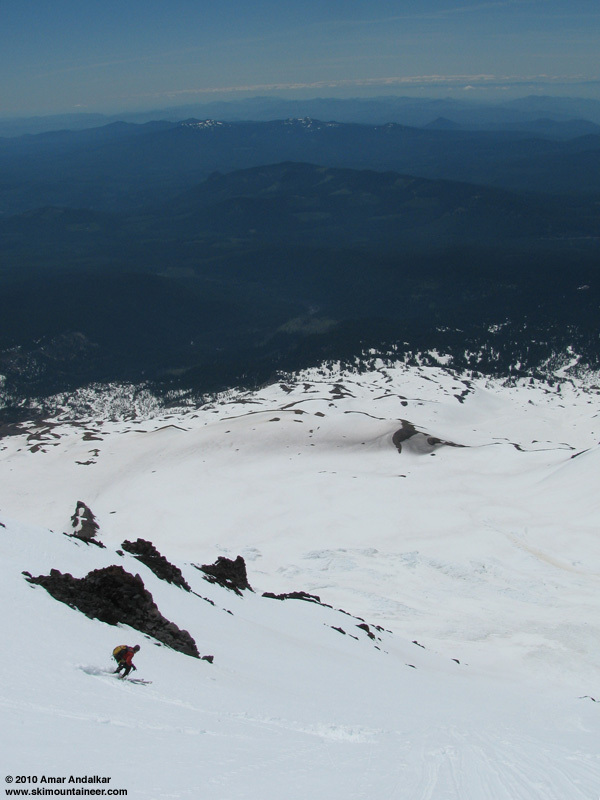 With an incoming upper level low (and its accompanying forecast of high winds at 14K by Sunday) thwarting our plans for an attempt at Tahoma Glacier on Rainier, it was time to look for a backup plan to fill the otherwise mostly-sunny weekend. 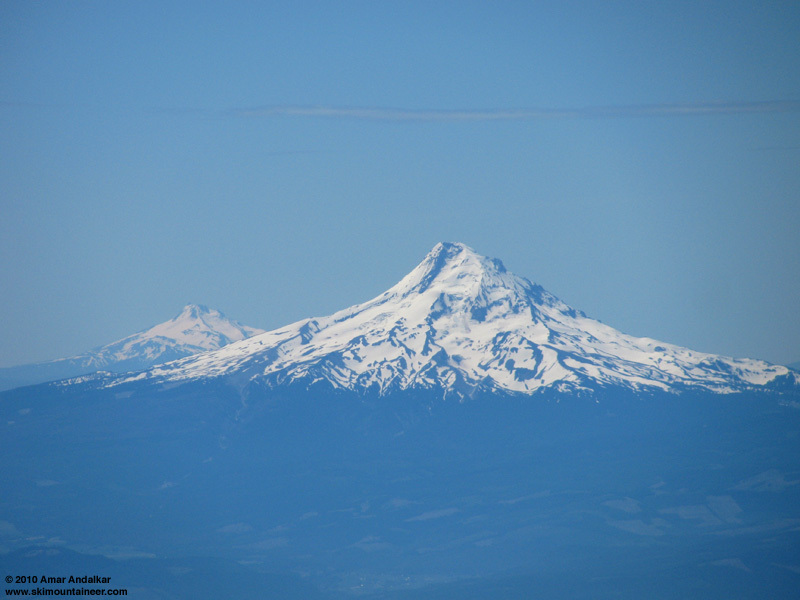 How about trying Mount Adams and Mount Hood, the two highest of The Guardians of the Columbia, back-to-back? Recent ski conditions reports from Adams had been stellar, and the road to Cold Springs had just opened to the trailhead only days earlier. Plus the road to Cloud Cap on the north side of Hood had just opened in early July too, making a one-day attempt there much more feasible. The new plan sounded good to Dave Coleman and also to the Browns (Dave, Stephanie, and Lander): ascend the South Rib of Adams on Saturday and try to ski the WSW-facing Avalanche Glacier Headwall (a steeper alternate to the over-popular Southwest Chutes), followed by a Sunday attempt at the Sunshine Route on the north side of Hood. 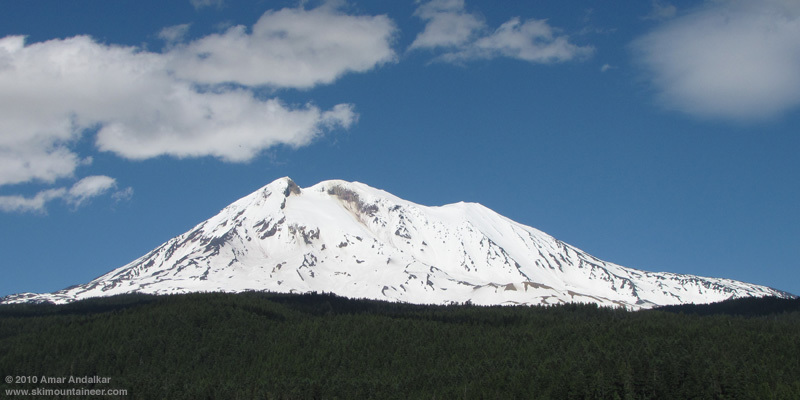 View of the west side of Adams, taken the next day from FR 23 north of Trout Lake, showing excellent snow coverage for July. 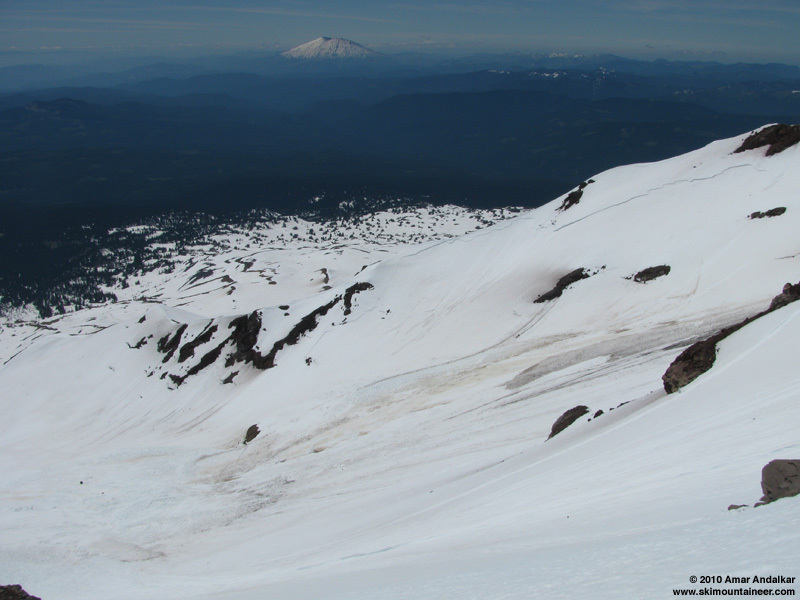 Zoomed version of previous photo, with Avalanche Glacier Headwall (left) and Southwest Chutes (right). By late Friday evening we were caravaning south from Seattle, and a painfully slow drive along Forest Road 23, along with a stop in Trout Lake to get climbing permits, brought us to Cold Springs Campground after midnight. Thankfully the last snow drift blocking the parking area had just been punched through, and despite dozens of cars being parked far downhill along the sides of the road, we were able to find ample room to park in the mostly empty main lot at 5600 ft. The Browns planned a 5am departure, while DaveC and I would try to sleep in a couple more hours. We slept solidly till 6:30am and finally headed up the hill at 7:30am, under unexpectedly mostly-cloudy skies and carrying skis and boots on packs. The trail was mostly bare, but we found continuous snow on the right side of the trail at 6000 ft about 1 mile from the trailhead. Skinned from there all the way to the summit, initially on moderately firm snow which had nearly frozen overnight, following the winter route near South Butte and up across the top of Lunch Counter (this is barely continuous snow in a few spots, if you want to skin continuously now, it would be best to stay on the summer trail route going left of Crescent Glacier instead). On the steeper part of the South Rib above 9500 ft, I used ski crampons since I had them, but DaveC skinned to the summit just fine without them. The clouds were quickly vanishing by mid-morning and the sun was softening the slopes to perfect corn. The morning cloud cover would hopefully delay oversoftening of the slopes by a couple of hours. Skinning across Lunch Counter, with dozens of dots ascending the South Rib far above. The Browns, with their 2-hour head start on us, had summited just before noon and skied down to us near 11700 ft as we ascended the final face to the summit. 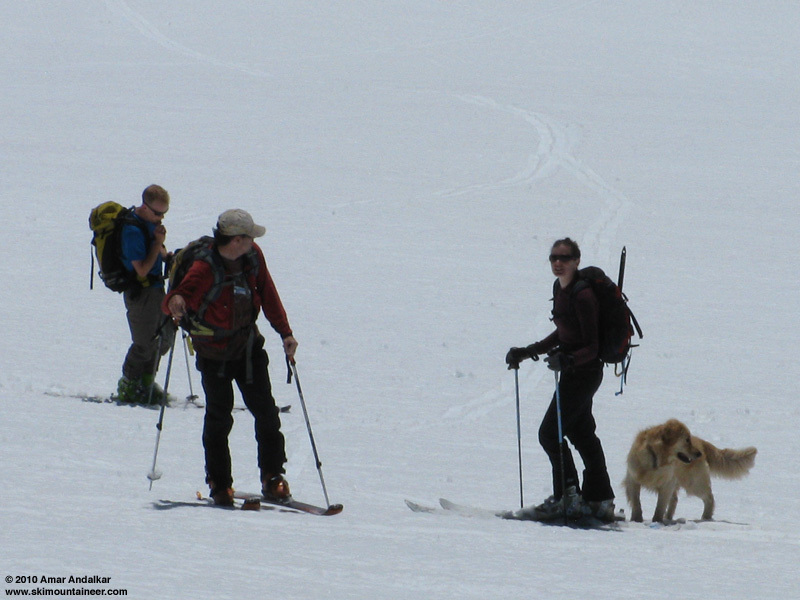 They decided to head for the Southwest Chutes, judging that Avalanche Glacier Headwall might be too steep for the youngest member of their family. 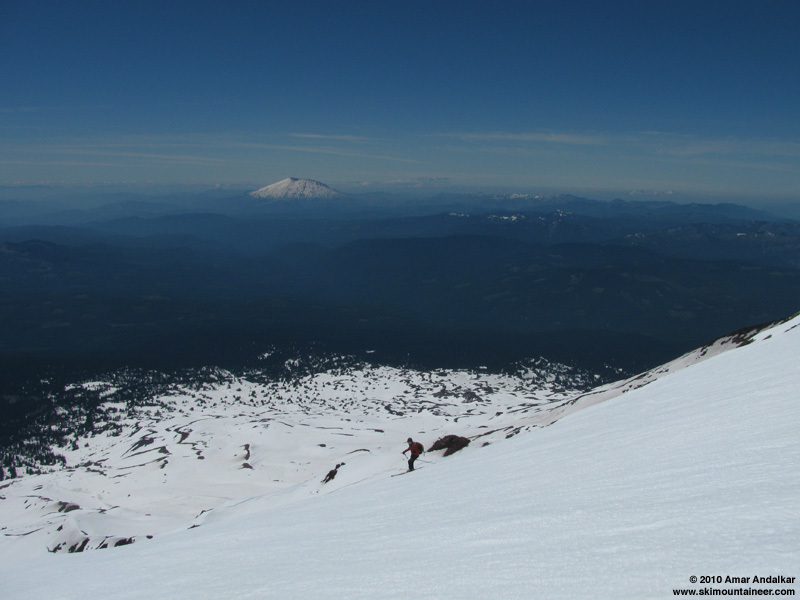 They later reported that ski conditions continue to be excellent in the Chutes. The whole group, reunited briefly on the south face of the summit dome. We finished skinning up the face and on to the roof of the still completely snow-covered summit building just after 1pm. Took a long break to enjoy the warm sunshine, nicely sheltered from the 15-20 mph NW breeze in the lee of the hut, and melted a couple of liters of snow on the Jetboil. Skinning up the last few feet up the roof of the snow-covered summit hut. Skied down at 2pm, taking a direct line straight down from the summit hut towards Avalanche Headwall, far to skier's right of the main bootpack and any other ski tracks. Excellent smooth untracked corn snow right from the top, with none of the nasty sastrugi and penitentes which are so typical of the summit slopes on Adams, especially nearing mid-July. Just amazing. 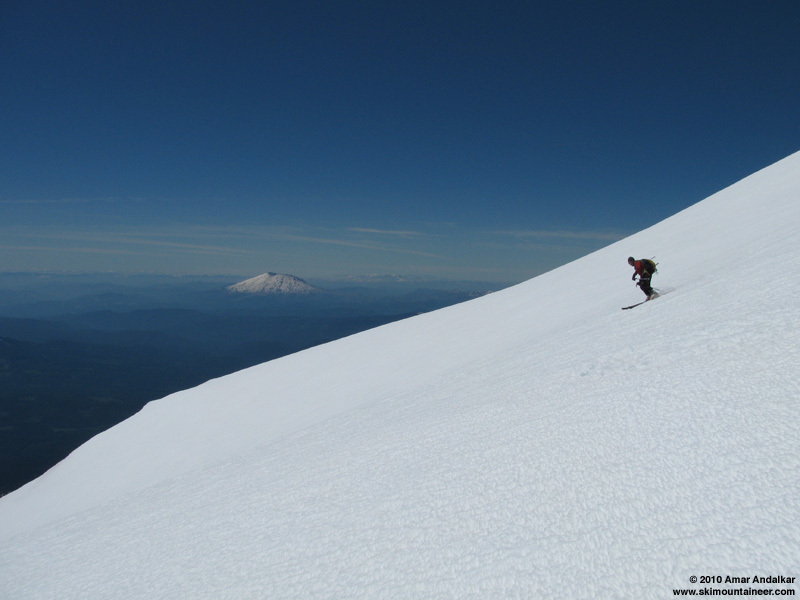 Skiing smooth perfect corn off the summit, with Mount Saint Helens in the distance. Dropped through the main gap near 11200 ft, a short pitch of 45-degree smooth corn between outcrops of rimed rock, onto the upper portion of the Headwall, a moderate 35-degree slope suspended in the sky above another steep rollover. More ripper corn here, as nice as it gets. More smooth perfect corn near 11000 ft on the upper Avalanche Glacier Headwall. And then rolling over the lip near 10600 ft, the slope tilting past 40 degrees and holding that pitch for another 2000 vert. Dropping down the steep lower Headwall. Large avy debris piles are visible below on the flats of the Avalanche Glacier. Unfortunately, the snow quality took a sudden turn partway down the face near 10000 ft: the skis now carved through the surface layer, making foot-deep trenches into the unconsolidated mush below. Then I set off a moderate-size wet slide, unusually fast-moving, which ripped down the remaining 1500+ vert onto the flats below, joining the numerous huge piles of recent and older avy debris which covered almost the entire lower portion of the mostly-inactive Avalanche Glacier. Cautiously skied the bed surface for the next few hundred vert. Large avalanche crowns from a recent avalanche cycle could be seen along the SE facing slopes to our right, at the NW margin of the Avalanche Glacier. Large crowns and avy debris on the NW edge of the Avalanche Glacier. Snow conditions improved again lower down, with a greater degree of consolidation as expected, and nice turns could be found on the oversoftened corn below 9000 ft. Overall, the snow conditions on the Headwall this time were not nearly as epic as on our previous ski of this route (June 15, 2008, Mt Adams, Avalanche Glacier Headwall), but we did have excellent smooth corn above the Headwall right from the summit this time, in contrast to the rough icy conditions up high in 2008. Soft corn on the lower Avalanche Glacier. 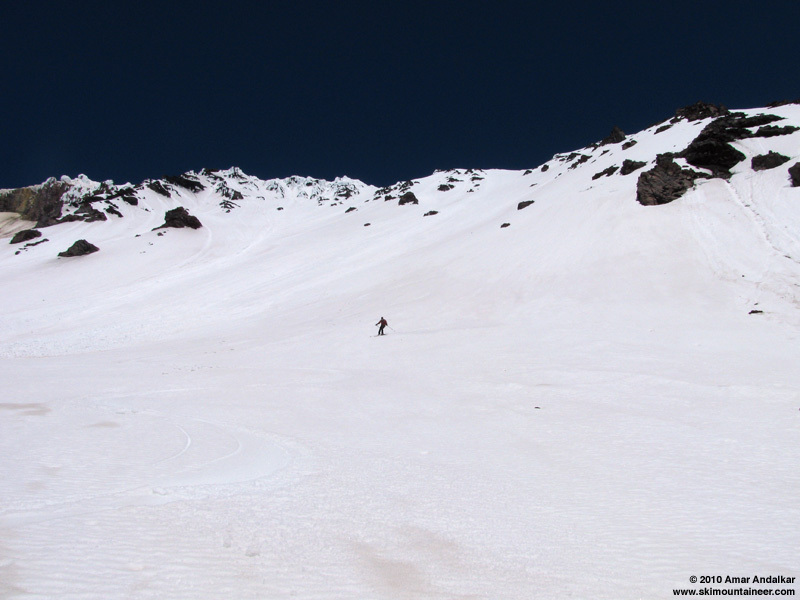 And then the long descending traverse: across the lowermost Avalanche Glacier, then around the corner into the bowl below the Southwest Chutes, then joining the numerous tracks exiting on the high traverse near 7200 ft. 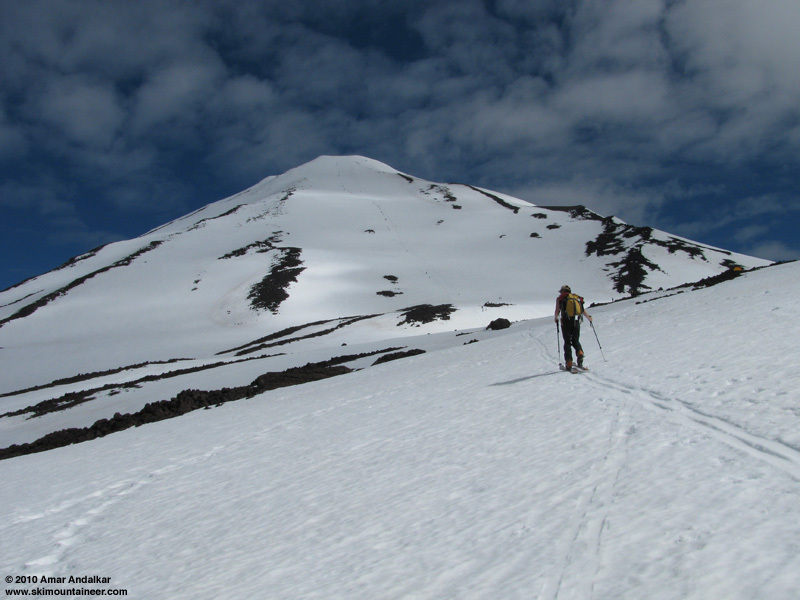 Unfortunately, the traverse requires a reascent of about 300 vert across the intervening gullies before arriving on the ridge beside the Crescent Glacier, on the snow-covered summer trail. A quick schuss down the sticky snow brought us to about 6300 ft. Then much routefinding (along with crossing a few ski-length bare patches) was needed to ski down the remaining skiable snow to 6000 ft, arriving at the bare trail just after 4pm within a few feet of where we had skinned up in the morning. A quick hike brought us down to the summery warm trailhead to join the rest of our group. Another fine day in the mountains, with the ominous clouds of morning evaporating into glorious warm sunshine. About 7100 ft of gain for 6700 vert of skiing, including a full ski ascent from 6000 ft up to the summit followed by some epic corn skiing right from the top. 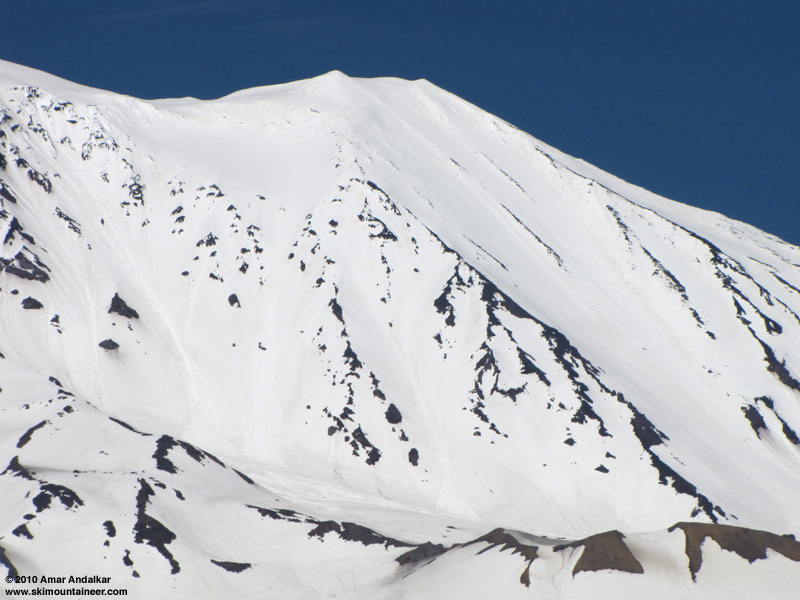 And despite a very busy day with hundreds of climbers on the second highest volcano in the state, there were actually surprisingly few skiers and boarders, perhaps only a few dozen up there today. 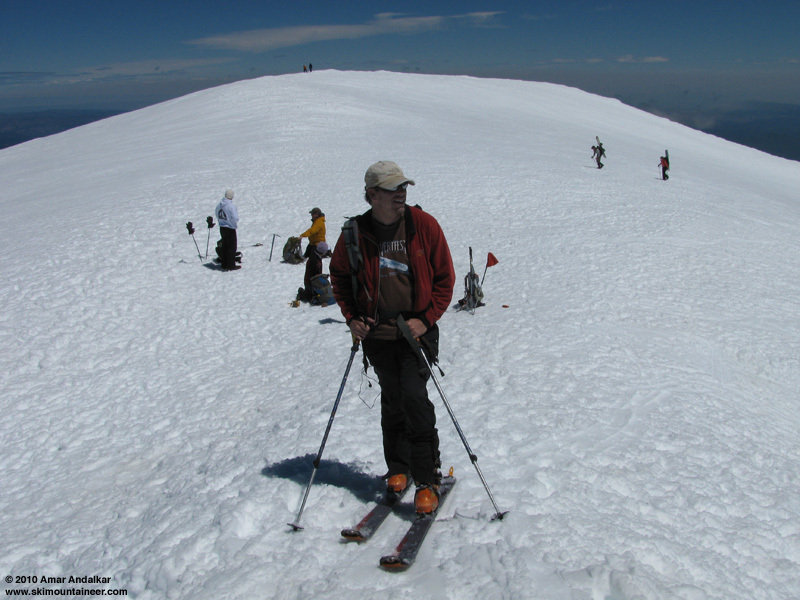 Overall, ski conditions on Mount Adams remain outstanding for mid-July. View from Pikers Peak of Mount Jefferson (left) and Mount Hood, looking directly at Eliot Glacier, Snowdome, the Sunshine Route, and Coe Glacier. 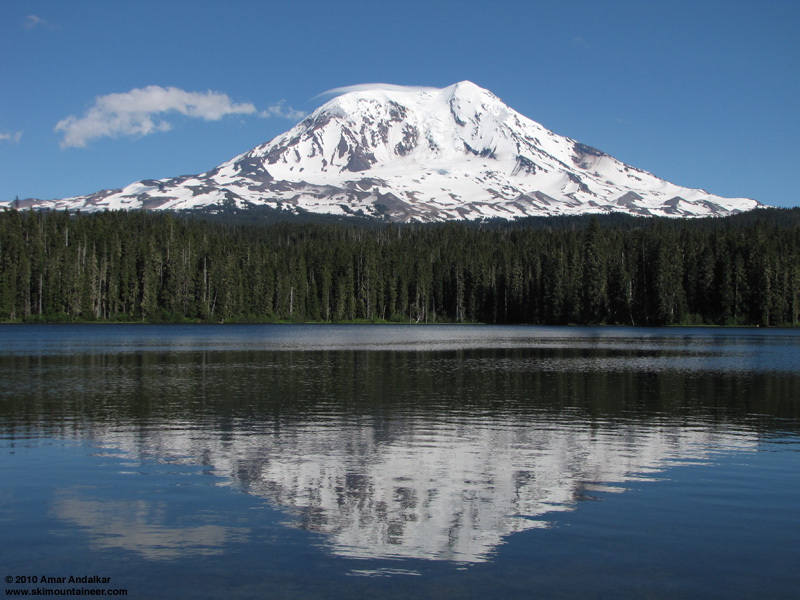 Bonus photo: View of the NW side of Mount Adams reflected in Takhlakh Lake (taken next day), showing Adams Glacier and the North Face of NW Ridge. Nice one Amar and crew. We skied up to the edge of Avalanche and ironically had some discussion about nearly everything you touched on. Potential softer snow as we descend on the steep slopes, potential avy with the soft snow, hiking up to get out and back to the traverse. A portion of our group was already nearly down the SW chutes with no idea that we were thinking of doing the Avalanche Headwall. So even though we got separated on the exit traverse, we opted to keep it together and traversed back for the SW Chutes. It sure looked smooth and very tempting, glad we opted for the SW Chutes with no avy activity, but they did start pulling the tails near the bottom. Way to get after it.